A woman suffered leg injuries after shots were fired at a house. A masked gunman was seen trying to force his way into the Liverpool home. A man was shot dead while waiting for his daughter outside a dance school. It's thought the girl witnessed the aftermath of the incident. Two police officers were taken to hospital last night after a crash in Merseyside. 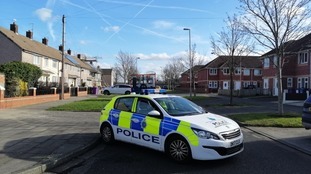 They were investigating suspicious circumstances in the Prescot area when their marked car was in collision with another vehicle on Warrington road. The crash happened at just before 9pm last night and roads in the area were closed. The driver of the other vehicle, a Ford Fiesta was uninjured. The North West Ambulance Service attended to assess the driver and passenger of the police vehicle and they were taken to hospital for further assessment as a precaution. An investigation into the incident has been launched and police are appealing for any witnesses to come forward. A man has been found dead and a woman is in a critical condition following a fire in Liverpool last night.